Everywhere there is a lot of communication about Human Resource Managers and Human Resource Management - but there is less communication with individual HR Managers in person. In these discussions everything revolves around the current processes and performance of HRM but the HR community increasingly talks about the overall prospective of “HRM” as well. These controversial opinions, often expressed in unusual harsh tones in my view, were an occasion for me to start a series of interviews with customers, partners and insiders of HR Management. Today I talk to Andrew Spence – a known HR Change Expert, Consultant and Blogger. He is known for giving often new impulses for strengthening the change capacity of HR. I would like to start by thanking him and would ask him to shortly introduce himself, before I start the interview. Andrew: I have always been fascinated by people, organisations and technology, and this is still my passion. I think many of our current people management practices belong in the last century and need to be redesigned for the digital economy. I work with organisations to prepare them for a fast changing workforce. I started my HR Transformation consultancy, Glass Bead Consulting, 10 years ago (spot the Herman Hesse reference) to help clients with this ever evolving journey. I also work with AI and analytics experts to solve business problems such as retaining talent, sickness absence and improving productivity. I studied Psychology and hold a Masters in Cognitive Science and Artificial Intelligence from Birmingham University in England, this was a few years before Siri and Watson were born! I contribute to the HR, workforce and technology ecosystem by freely sharing knowledge, techniques and resources including speaking at conferences, blogging, training and tweeting @AndySpence. I strongly believe that as a community we should share and collaborate as much as possible to achieve better results. Peter: Thank you very much for your brief introduction. What is your position in HR Management or rather where are your links to HR Management? Andrew: My expertise is to work out which HRM practices will deliver the business goals, and design or improve the overall HR operating model. My clients tend to be experts at managing talent, hiring and firing, reward, employment law etc. My position in HR Management is generally to make sure all the different elements work together to support the business and often to help manage the journey to a new way of working. Peter: What is your opinion of the current status or standing of HR Managers? Andrew: We are at an interesting junction point for HR, with many redefining how HR brings value to businesses. The current standing of HR Managers follows a wide range, across industries and geographies. The lowest level is being raised slightly as HR technology moves to the cloud. Companies can buy HR technology that provides a reasonably standard compliant process. There is also much more sharing of knowledge and skills enabled by social media. However I am now seeing the best HR Managers sprint away from the crowd. This group tend to apply scientific principles, are commercial, and have an enthusiasm for technology. They are also impactful operators in their organisations. In competitive industries these HR leaders are game-changers. Peter: In your opinion, why is HR Management so often and to some extent fiercely criticized today? Andrew: HR Management is complex and difficult as it involves working with us unpredictable humans! Part of the issue was the poor execution in the move to the Ulrich HR Operating Model over the last 15-20 years. The weakest link was the definition of the HR Business Partner, often re-badging HR Managers with a more strategic agenda and often without the skills or ability. This put individuals between a rock and a hard-place, between managers and the executive. A better generation of HR Business Partners is emerging, however many HR Operating Models will creak in the next few years. Another issue is many of our HRM practices are not proven to actually work. As an example, we have spent the last decade persuading managers and executives to carry out Engagement surveys and action plans. But do we really know what Employee Engagement is, what causes it and whether it drives increased productivity? I think many employees realise these processes don’t work, so HR loses credibility and there can be resentment. The difficulty for some in HR is that we have become experts at managing these processes, and changing them seems too difficult. We need to be more inquisitive and rigorous with our research before asking Managers to perform new activities. Peter: Where do you anticipate specific need for change in performance/service and provision of HR Management? Andrew: Many of our existing practices are being challenged as organisations move to new business models. There is a specific need to apply more evidence-based management techniques to evaluate which practices and interventions are more likely to deliver results. HR also need to be ‘technology champions’ in our organisations working closely with colleagues in technology. We don’t have to be the coders, but we need to be an effective interface with employees to understand what they need to be more effective in their roles. We also need to manage the change more effectively. In short, a new breed of HR leader is emerging, and hopefully many will have acquired some of this knowledge and acquired skills from University courses. 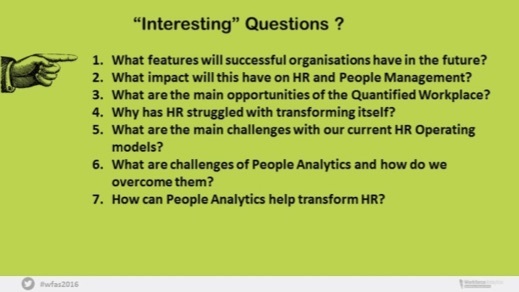 Peter: What will be the main focus/topics of HR Management in 10 years? Andrew: If I may extrapolate some of the future organisational trends I am seeing today, I would guess that :- Most people management activities will be carried out by managers/employees in 10 years time. The focus will still be on productivity, resource optimisation, coaching and workforce technology. Employees will use tools that combine data and robust predictive models to make better decisions. We will have a few years of decent people data by then, supplemented with new data sets including biometric, location and performance. I pick up on some of these opportunities in my article “The Quantified Workplace:Technology vs Trust”. “Work” itself will be redefined and carried out by a broader set of people, contractors, augmented humans, robots and automated systems. Traditional hiring activities will be massively reduced. Workplace matching tools will make employee supply and demand more seamless, maybe using blockchain type technology. This will give more transparency and reduce the need for agents such as recruiters. So the role of a central HR team to enable this will have very different skills to now. People strategists, workforce technology experts, organisational experts, behavioural scientists, performance coaches, perhaps procurement of services and legal compliance. As I describe these skills, some might suggest they are better deployed outside a traditional central HR function. Peter: Now my final question 5+1 (for advice for my alumni and students): What would you advise young HR Managers or students, who seek a career in Human Resources? What should they pay attention to? What is and what will be important? 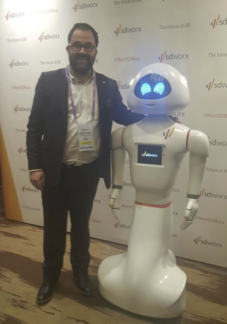 Andrew: For those who have an interest to work in HR and the fascinating intersection of people, organisations, change and technology, then it is worth following the trends that are shaping the future world of work. How will work be organised and which business models will be prevalent? I have mentioned some of the skills that will be valued such as behaviourial science, data science, AI, workforce technology including collaboration tools. If you want to focus on a particular industry, I would also get some experience outside HR in the industry you want to work in. The most effective HR leaders I have worked with have often had careers in different parts of the business, are credible, commercial and impressive at delivery. Your network will be your most valuable asset, so nurture it. People will be moving around work contracts much more frequently, so your network is invaluable. Try and get yourself a mentor. And finally, continue to be intellectually curious - keep asking lots of questions! Peter: Thank you very much for your insightful contribution. I wish you continued success, many friendly clients and many HR change ideas at all times. Human Resource Management System automate each of the core HR processes that have to be executed throughout the complete life cycle of employees within your organization. nice post! I really like and appreciate your work, thank you for sharing such a useful tips, keep updating the information, hear i prefer some more information about jobs for your career hr jobs in hyderabad . Such a nice blog i really like what you write in these blog i also have some relevent information about online hrm software if you want more information.